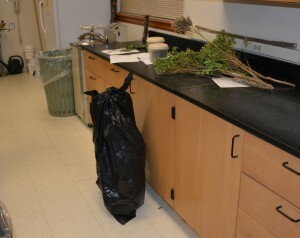 Boxwood samples have been coming into the Plant Diagnostic Laboratory on a daily basis since the winter. Most of them have been diagnosed with winter damage, boxwood leafminer, or Volutella stem and leaf blight. Yesterday, we got our first sample with boxwood blight! The situation was typical of several others in New Jersey – new transplants this spring and then a bunch of dead shrubs mid-summer.